I have a soft spot for novels that feature real buildings as a central “character”. The most obvious on this site would be Simon Mawer’s 2009 novel, The Glass Room, which places Mies Van der Rohe’s Villa Tugendhat front and centre in its story. So when an Author’s Note at the beginning of A World Elsewhere alerted me to the fact that it was inspired by a visit to the Vanderbilt family’s Biltmore estate in North Carolina, I was more than curious. I know Wayne Johnston’s work well (he is a Shadow Giller winner for The Colony of Unrequited Dreams in 1998, a year when the Real Jury preferred Alice Munro’s The Love of a Good Woman). The thing about Johnston is, that while he now lives in Toronto, he was born and raised in Newfoundland. His previous writing is a textbook definition of “Newfoundland” fiction (Joey Smallwood features as a character): What is he doing setting a book on a massive estate in North Carolina? Johnston also increased the risk factor, at least for this reader, in that same Author’s Note by revealing that his wealthy American family would be called “the Vanderluydens, after the Vanderbilt-like Van der Luydens of Edith Wharton’s novel The Age of Innocence“. Those who are aware of my affection for Wharton can understand that “borrowing” her family, from one of the world’s best novels ever, might not be a good idea. Landish Druken lived in the two-room attic of a house near the end of Dark Marsh Road that was in no way remindful of any other place he’d ever lived. A mile away, in a twelve-room house, his father lived alone. Under the terms of what Landish called the Sartorial Charter, his father had let him keep his clothes but had otherwise disowned him. When he was too hungry and sober to sleep, he walked the edge of the marsh in the dark, smoking the last of his cigars, following the road to where it narrowed to a path that led into the woods. He had gone to Princeton, where father-made men spent father-made fortunes. Now they were back home, learning the modern form of alchemy, the transmutation of sums of money into greater sums of money. None of that for Landish, however. He’s a writer, although in five years he has yet to write a word — he carefully burns his output each night. And the implied bargain with his father when he was sent to Princeton was that upon his return to Newfoundland he would take over as captain of the Gilbert, the family’s sealing ship. While his career determination is a problem, Landish has an even bigger one. His father had abandoned his first mate on the sealing ice when the Gilbert was in a blizzard. Francis Carson’s wife was pregnant, but she dies as well — Landish, in a fit of guilt, gives the nuns at the local orphanage $50 and takes over the wardship of Deacon (named after the orphanage, Cluding Deacon). Things are not going well in St. John’s and that’s when Landish starts looking to the prospects of renewing acqaintances with his best buddy from Princeton, Padgett Vanderluyden, known as Van. Landish couldn’t help but like Van who, minutes after they met, had confessed that he was widely regarded as a “dud”. “My father thinks I am one,” he said. Who better than the richest man in the world to spy out a dud amongst his children? But Van said he was going to surprise everyone by doing something “big” with his life. That “big” is building the Vanderluyden estate. Landish and Van did not part on good terms (Van wanted him to help with the planning and building) but a broke Landish, with a child to support, appeals for help — and gets a ticket to North Carolina. There were three brothers who were known as Pliny the Elder, Pliny the Younger and Pliny the Tiny. There were the Duke of Unwellington, Le Marquis de Malarkey, the Duke of Buxomberg and Sorethumberland. “The flatulent are petulant,” Landish said. He could get the boy to walk more often if he could stand to eat cabbage a deux more often. They had veg-edibles and Dark Marsh Fish. France’s bacon, henglish eggs. Cod au cretin. Black Forest Cram. Dark Marsh Toad. The traditional Easter Rooster. It was annoying enough that I was seriously contemplating abandoning this novel at the halfway point. And then Landish and Duncan arrive at Vanderluyden and things start to get interesting. 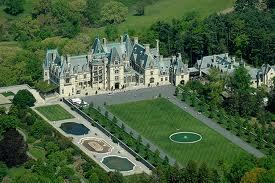 The place itself is bizarre (I’d say even the real Biltmore is bizarre); the inhabitants are even stranger. Yet, somehow, Johnston makes it work. The puns keep coming, alas, but a cast of truly strange characters starts to come together. I won’t say anymore — fantasy novels (with thriller overtones) need to be appreciated on their own. A World Elsewhere may be one of the stranger books that I have read this year, but I can’t say I was disappointed by the experience. It would be wrong to spoil it. This entry was posted on September 14, 2011 at 5:52 pm and is filed under 2011 Giller Prize, Author, Johnston, Wayne (2). You can follow any responses to this entry through the RSS 2.0 feed. You can skip to the end and leave a response. Pinging is currently not allowed. For a minute there, I thought his name was Landish Drunken. Had to read that a couple of times. What’s the year setting for this? Guy: I am pretty sure you were meant to think “Drunken”. Also, Landish’s middle initial is “B” which sets up an anagram for him late in the book when you use his mother’s maiden name (Marcot). The novel says that Van started building the estate in 1893, so this would be set a few year’s later. I do think Johnston is a superb writer – The Navigator Of New York is gloriously well done – and your review suggests this is all rather odd. I’m in. It is odd, which is to the author’s credit. And it is probably closer to The Navigator of New York than his other novels. While I liked this one, have to say it’s my least favourite Wayne Johnston to date. The puns were desperately drunken wit, as they were meant to be. I found there was just something off about this novel’s scope, if that makes any sense: it was neither small and totally focused on Landish’s life, nor really broad and sufficiently focused on Van’s world. It had really Gatsby-ish thematic overtones (the rich are different from you and me, they’re careless and don’t care what they smash or leave behind in their wake), but I found Landish’s reactions both to his father and to Van far too accepting and resigned, which made the devotion to the fur hat more than a tad implausible and not quite over-the-top enough. It’s a strange and interesting novel – I might reread it at some point down the road. Ruth: I would agree that Johnston’s previous novels were “bigger” books and that fed my frustration with the first half of this one. The attempt to be clever and cute just seemed overly forced. What changed my attitude (at about the halfway point) was the growing realization that every one of the characters was woefully incomplete — and that very lack sparked my interest. (I’d say young Deacon is the most complete of the bunch.) That, coupled with the way Johnston picked up his version of drama, led me to quite appreciate them all by the time the novel ended. I’ll have to give this a go if only because it’s set on the good ship Gilbert! It sounds completely mad. Mary: I think being forewarned about the puns and clever word devices might help — I can’t wait until you meet Nun Too Soon. With the references to punning and so forth, I’m reminded of some of my favourite Jasper Fforde novels. Now, there, you expect it. With Wayne Johnston, and I haven’t read a word of A World Elsewhere, you just don’t expect it, and it sounds a little…off. Kevin, in your opinion, did it add or detract from the book or did it just sail off into nowhere in particular? Emily: I should say upfront that I am an “optic” reader, not an “aural” one, so a lot of puns pass me by. And when I do get them, I tend to find them intrusive, not useful. Blame all that on my Grade Three teacher, Miss Watson, who instilled the “we do not move our lips when we read” maxim deeply in my reading brain. That’s certainly the way I felt in the first half of this book — I thought Johnston was struggling to be cute and clever (I was actually starting to find comparisons with some of the awkward labels in Room, a 2010 novel that I did not like very much). As I have indicated, the last half of the book did set up a different rhythm that I found of more interest. I started to see that some of what I had thought were weaknesses from the author were actually deliberate parts of his construction. I still don’t think it is a great novel (I’m predicting it will be somewhere Giller midlist for me) but I have some admiration for what Johnston tried to accomplish with it. Reviews like this are most helpful to the rest of us for the very reason you stated: sometimes an authors quirks take time to settle in –time we are not always willing to give. (I recently almost abandoned McEwan’s Atonement over just the same early and off-putting problem.) Now I’m glad I didn’t. Without someone who will push on, many of these writers wouldn’t get the chance to redeem themselves in the second half, or in a second book. Still, it raises the question: why make the first half so difficult? Don’t you think this is a flaw? Or are there other qualities – in the first half already – that make perseverance worth it? I cannot decide yet whether Johnston is worth the time spent, let alone a worthy prize contender. Still puzzling . . .
Kevin: Well, the biggest issue with me in the first half was simply familiarity with the author’s previous work and the personal expectations arising from that. Johnston’s previous novels were large narratives, with a highly traditional structure that brought its own appeal. So the early parts of this one, with the clever puns and small incidents (that can’t be avoided when a child is one of your central characters), left me feeling that Johnston simply didn’t know where he was going and was “writing around” the issue. Later, as his flawed and absurd characters acquired more shape, I found I had much more to consider. I would be on the fence when it comes to recommending it — a lot is going to depend on whether the reader wants to invest the time in a work that is essentially “playful”, with its message reflecting off that. I’d certainly point people to any of Johnston’s previous works first if they don’t know him, simply because they are more accessible. I had the opposite response to Atonement. I very much enjoyed the first part of the book, interest lagged severely in frustration thru the second third, but did revive in the last bit. That is actually a common problem for me with MacEwan — he both starts and ends a story well, but tends to get self-indulgently distracted in the middle. My reactions to A World Elsewhere were so different that I don’t think I would make any comparison with the two — beyond, of course, the basic one that class conflict is present in both. With both authors, I think I would have to acknowledge that, having read so much of their work, I do pick up a new book with certain expectations — and accept responsibility that perhaps I should take some care in judging them when they have chosen to head off in a different direction. Seems I’m in the minority in this corner, but I absolutely loved the wordplay in this novel. (That was one of my favourite aspects of Jessica Grant’s Come Thou, Tortoise too.) And the playfulness added to the credibility of the relationship that develops between Landish and Deacon; without it, I’m not sure that their connection would have resonated for me. Although I’d agree that this novel is more like his NavofNY than Colony (speaking of other Giller contenders only), I actually enjoyed it much more than NavofNY. (Colony was one of my favourites of that reading year, and I’d certainly love to re-read it.) But I do recall reading NavofNY hurriedly (it was a copy borrowed from a friend who needed it back unexpectedly) and I could easily have missed some of my favourite bits in this one (my thoughts on it are here, if you’re curious) if I’d rushed with it too. This was the first of the longlisted books that I read for this year’s G; other than that, our reading of them hasn’t matched up yet, but I’m looking forward to other Shadow Giller responses. BiP: Thanks for your thoughts. I do think there is going to be a split response between “playful” and “annoying” — and as I have said in some previous comments, I do wonder how much my expectations were the reason for my reaction early in the book. It is very good to hear from someone who did not experience that barrier. If it makes the shortlist, I’ll give it another go — with a different opening attitude. I only just read this review. Unfortunately I have an incredibly low pun tolerance factor, which I suspect would make this a non-starter for me. Interesting though that you describe it as a fantasy novel, what was it that brought you to use that term? Max: I called it a fantasy novel because that seemed to me the best way to describe Landish’s world view — which dominates the novel. Offset, of course, by an equally fantastic world view from Vanderluyden. I realize that is not the conventional ideal of “fantasy novel” but it seemed the best description that I could come up with. And if you don’t like puns, I’m fairly certain you wouldn’t like the novel.